A press conference on this topic will be held Monday, April 3, at 1:30 p.m. Pacific time in the Moscone Center. Reporters may check-in at the press center, South Building, Foyer, or watch live on YouTube http://bit.ly/ACSLive_SanFrancisco. To ask questions online, sign in with a Google account. SAN FRANCISCO, April 3, 2017 — Billions of pounds of plastic waste are littering the world’s oceans. Now, a Ph.D. organic chemist and a sailboat captain report that they are developing a process to reuse certain plastics, transforming them from worthless trash into a valuable diesel fuel with a small mobile reactor. They envision the technology could someday be implemented globally on land and possibly placed on boats to convert ocean waste plastic into fuel to power the vessels. The researchers will present their results today at the 253rd National Meeting & Exposition of the American Chemical Society (ACS). ACS, the world’s largest scientific society, is holding the meeting here through Thursday. It features more than 14,000 presentations on a wide range of science topics. His partner, Swaminathan Ramesh, Ph.D., was driven by the desire and excitement of searching for a new “killer idea” with the power to change the world. Ramesh took early retirement in 2005 from BASF after 23 years as a research chemist and began looking for new opportunities. Ramesh formed EcoFuel Technologies and coupled his chemical knowledge with Holm’s concerns about plastic wastes and ocean pollution. In the meantime, Holm had formed Clean Oceans International, a nonprofit organization. They sought to optimize a technology that can use waste hydrocarbon-based plastics as a feedstock for valuable diesel fuel. Their goal was to rid the world of plastic waste by creating a market for it. For years, Ramesh explains, pyrolysis technologies have been used to break down or depolymerize unwanted polymers, such as plastic wastes, leaving a hydrocarbon-based fuel. But the process usually calls for complex and costly refining steps to make the fuel useable. Ramesh set out to change the game and developed a metallocene catalyst deposited on a porous support material that, coupled with a controlled pyrolysis reaction, yields diesel fuels directly without further refining. It is also cost-effective on a small scale, runs at lower temperatures and is mobile. “The catalyst system also allows us to perform the pyrolysis as a continuous-feed process and shrink the footprint of the whole system,” Ramesh says. “We can scale the capacity to handle anywhere from 200 pounds per 10-hour day to 10,000 or more pounds per 10-hour day. Because of its small size, we also can take the technological process to where the plastic wastes are.” The whole system can fit in a 20-foot shipping container or on the back of a flat-bed truck, Holm says. The next step, they say, is to show the technology works well and that it can create a useable drop-in diesel fuel. They will soon conduct a demonstration project for the government of the city of Santa Cruz, California. Officials there are interested in implementing the technology to address waste plastics that currently cannot be recycled, as well as to formulate diesel fuel the city can use for its vehicles, Holm adds. The team has received private funding for this project. Development of the catalyst system and reactor are self-funded by Ramesh and his company EcoFuel Technologies. 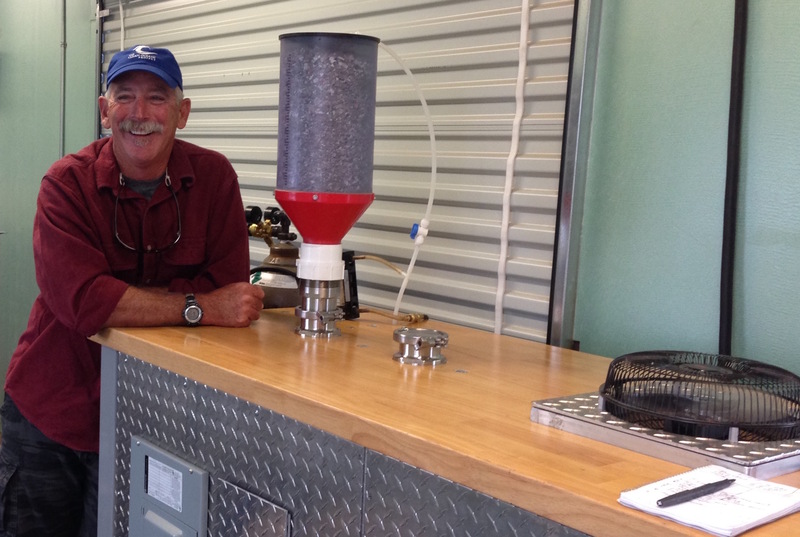 James Holm (pictured) and Swaminathan Ramesh, Ph.D., teamed up to develop a mobile reactor (also pictured) to convert waste plastic into fuel.